A 37-year-old Maine woman has been arrested for allegedly sending a threatening letter to Sen. Susan Collins, federal authorities said Monday. Sen. Susan Collins talks to reporters on Capitol Hill, Sept. 17, 2018, in Washington. Suzanne Muscara, of Burlington, was arrested Friday with mailing "threatening communication" to Collins, according to the U.S. attorney's office. The letter, sent in October 2018, was leaking a fine white powder and contained a threat, according to federal prosecutors. Muscara allegedly sent the letter to Collins' home in Bangor. The threatening letter was received by Collins’ husband, Tom Daffron, not long after the Republican was criticized for her decision to vote for the confirmation of Brett Kavanaugh to the Supreme Court. At the time her communications director, Annie Clark, said it was said to have been contaminated with ricin though tests later confirmed there was nothing toxic. On Monday, Clark released a statement commending authorities on the arrest. 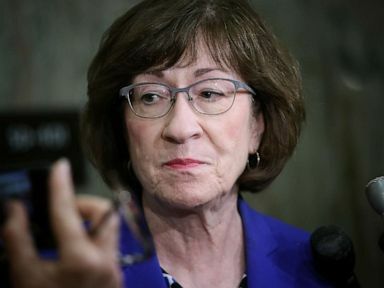 "Senator Collins and Mr. Daffron greatly appreciate the extraordinary efforts made by state and federal law enforcement agencies which culminated in an arrest in this case,” she said. In announcing her arrest, federal prosecutors said nothing about Muscara’s motive. Muscara was due to make an initial appearance in federal court in Bangor Monday at 2:30 p.m. If convicted, she faces up to 10 years in prison and $250,000 fine. It was not immediately clear whether she had an attorney. 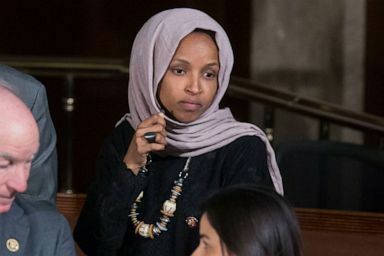 The arrest comes a few days after a 55-year-old New York man was arrested for allegedly threatening to murder Minnesota Rep. Ilhan Omar. Democratic Representative from Minnesota Ilhan Omar attends a joint meeting of the Congress, on Capitol Hill in Washington, April 3, 2019. Patrick W. Carlineo Jr. allegedly called one of the congresswoman's staffers on March 21 with a threat. Carlineo has a hearing in federal court on Wednesday. He, too, faces 10 years in prison or a $250,000 fine if convicted.